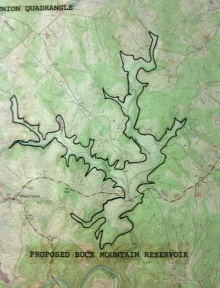 The Buck Mountain Reservoir was a concept included in community water supply plans from the early 1980s to 2004. Land was purchased by the Rivanna Water & Sewer Authority for the reservoir in 1983[study 1] on Buck Mountain Creek near Free Union, VA. Assessments of the James spinymussel (Pleurobema collina), a federally-listed endangered species, were made in the reservoir area in 1996 and 2004. [study 2] The identification of the James spinymussel was one factor that has led to reservoir construction at Buck Mountain being eliminated from local water supply plan alternatives. Gannett Fleming's 2004 Water Supply Alternatives Supplemental Evaluation reviewed 22 water supply options, two of which involved dams on Buck Mountain Creek. The second alternative involving a dam at Buck Mountain Creek was also not recommended, in part, because of the James spinymussel. "RWSA proceeded with the planning and design of Buck Mountain Reservoir through the mid 1990’s and by that time had acquired all of the land necessary to build the proposed reservoir." "Implementation of the Ragged Mountain Expansion project will produce unavoidable impacts to approximately 2.6 acres of wetland habitat including 1.43 acres of palustrine forested, 0.07 acres of scrub shrub and 1.08 acres of emergent communities. Similarly, a 45’ increase in the dam will inundate approximately 14,500 linear feet of narrow, shallow headwater stream channels....Of articular interest is watershed-scale preservation and enhancement within RWSA’s Buck Mountain Creek property. Consisting of more than 1,800 acres with 60,000 linear feet of tributary stream channels, this concept is considered to have the important benefit of enhancing, protecting and preserving known habitat for the James spinymussel, a federally listed endangered species." ↑ Web. South Fork Rivanna Reservoir and Watershed: Reflecting on 36 years, Anticipating 50 years, Stephen P. Bowler, available through Charlottesville Tomorrow, Spring 2003, retrieved 25 Jan 2010. ↑ Water Supply Alternatives Supplemental Evaluation, Gannett Fleming, July 2004. ↑ "An Artful Compromise." Editorial. The Daily Progress [Charlottesville] 1 Nov. 1982: A4. Print. ↑ Cromwell, Treva. "Shoot-Out at Buck Mt." Address to the Albemarle County Rotary Club. 1982. Speech. Cromwell typed up her prepared remarks for this address which occurred "sometime in 1982, shortly after the Buck Mt. Purchase issue had been resolved." ↑ Ketcham-Colwill, Jim. "County Stalls Reservoir Compromise." The Daily Progress [Charlottesville] 4 Nov. 1982: A1. Print. ↑ Ketcham-Colwill, Jim. "County Joins in Reservoir Puchase Pact." The Daily Progress [Charlottesville] 6 Jan. 1983: A1+. Print. This page was last edited on 27 January 2012, at 11:55.